In our office, we have switched from Secret Santa to Bad Santa. In Bad Santa, each member of the office draws a number from a hat. The lowest number then starts by picking and opening a present from a pile of wrapped presents. The next lowest number has the choice to either take the present of the person preceding them or pick from the random pile. As the game goes on the people with the higher numbers have options on all preceding presents which should, in theory, leave the highest number with the best or most suited present. For markets, we may be switching the other way, from Bad Fed... to Secret Fed. For the last few years, the Fed has been on a largely pre-set well-telegraphed course of hikes, putting the Fed in the bad camp for risk assets, particularly of late. However, as 2019 comes into view we may be in for a period of the Fed pausing and moving to a stance of being more open to the data they see in front of them and perhaps a less transparent course of where we are going next. For our Livewire Christmas Cracker, we look at what this may mean for investors. What would a Federal Reserve pause mean for markets? There have been several instances over the last 30 years of pauses, which I define as being a medium-term high in the hike cycle. Highlighted below with the arrows. 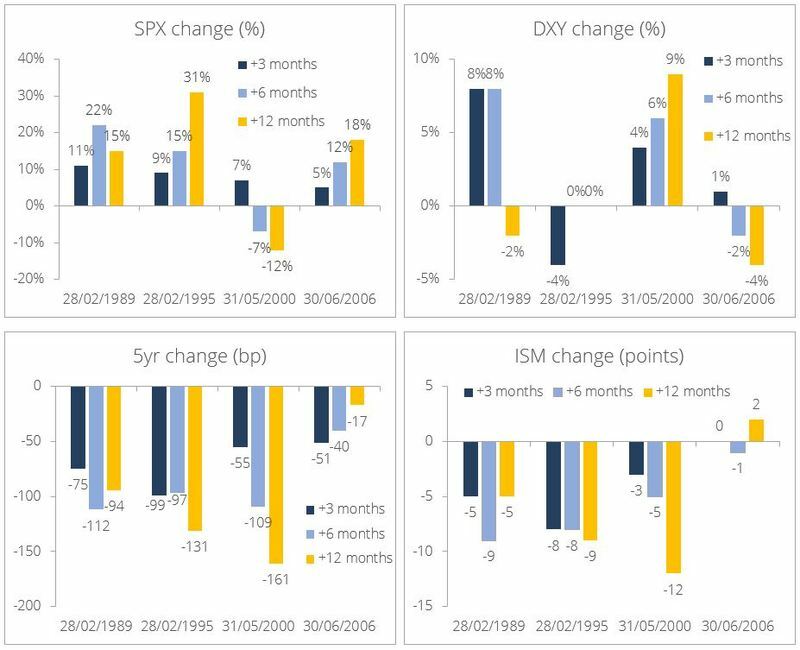 The table below shows how various key data points move between the month of the last hike and the following 3, 6 and 12 months looking forward. I have chosen to look at the S&P 500, Dollar Index, 5y US yields and Institute of Supply Management (ISM) manufacturing index. Each period has its own twists and turns and story to tell and I will leave the reader to look into the narratives of each time, but here are some general takeaways. When the Fed goes on pause it tends to occur into a period of weakening ISM/growth outlook. As such one should not be surprised to see ISM fall another 5-10 points even after the Fed have stopped hiking, i.e. the Fed pause takes time to work its way through the system and does not provide immediate economic relief. The equity market appears to look through the weak ISM, and more often than not rallies, and in some cases quite significantly, with double-digit returns over many periods of look forward. Bond market yields consistently fall across time frames, and again, by not immaterial amounts. Yields were much higher back in prior pause cycles but the falls seen register with magnitudes of 100bps in some cases. The Dollar index is more complex and had mixed results, but of note, the falling yields and falling US growth did not simply mean a weak dollar. Well, if we find ourselves staring at weak growth and ISM prints in 2019 and the Fed moving to pause, then some lessons from the past show that things may not turn out as bad as they feel. For more information and additional insights from Morphic Asset Management, please click here.